Nigel Green's philosophy on good practice revolves around having the client’s needs placed at a paramount level. Green's belief is that only by generating a full understanding of the client’s circumstances, can the most suitable solution be constructed to effectively serve their requirements in a compliant manner. Since its formation in 2002, the deVere Group has grown massively throughout the years. With over 70 offices around the world, including Abu Dhabi, Dubai, Moscow, London, Miami, New York and Hong Kong, the deVere Group strives to be as accessible as possible, wherever its investors happen to be. Under Nigel Green’s stewardship, deVere Group has made a name providing expert, impartial financial advice to expatriates and international investors around the world. Amongst other services, deVere Group offers advice on international savings, bonds, life insurance, pensions and structured products. As often explained by Green himself, many individuals are often too busy to extensively analyse their fiscal matters in meticulous detail nor do they have the time to always keep abreast of what financial initiatives are available. Nigel Green ensures that deVere's consultants do not know what a 'typical' client is, because each person has his own varying needs, goals and financial aspirations. With this in mind, deVere's financial advisers are committed to helping all our clients become financially independent and secure. Our financial advisers understand that and as such choose to dedicate the appropriate time to understand their client's goals carefully and then create the best possible path for them to achieve those goals. deVere Group therefore sees it as its own responsibility to offer expats the best financial solutions, especially when it comes to international financial planning and asset security. Moreover at deVere Group, the distinct differences between each client are embraced. Our team of independent financial advisers work with each of our clients individually, assessing their diverse financial goals and requirements, to build the best fiscal plan for them to achieve their goals. 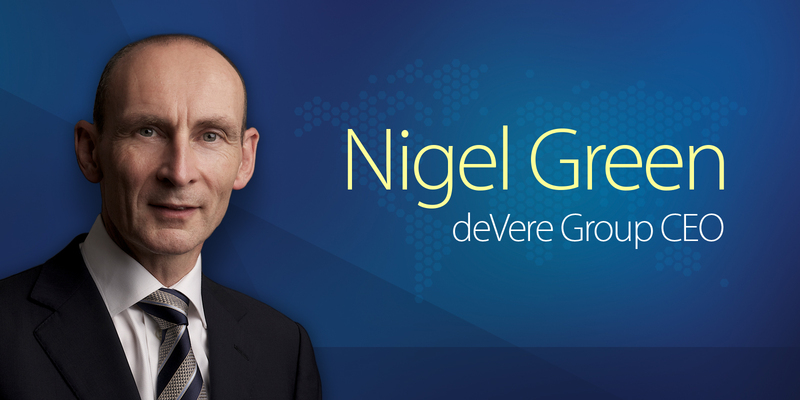 Nigel Green’s belief is that the closer deVere Group can be to its clients – no matter where they are in the world – the better we are at providing them with the high quality financial advice they have come to trust us for. Read more about Nigel Green in Testimonials.